I got this book because I saw the movie trailer and thought it looked hilarious. So when I saw it on netgalley I knew I had to read it. 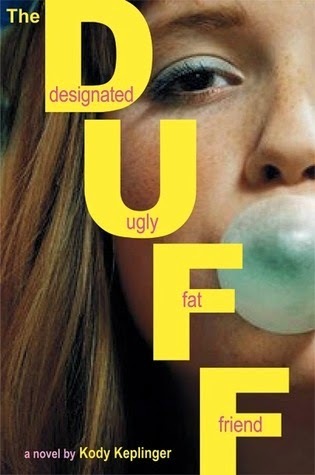 The DUFF was an extremely cheesy novel that had all the stereotypes except it was a completely character driven book. At no stage did I find any of the characters annoying (as I usually do in these kind of books. I loved Bianca and Wesley together because I think it was a very realistic relationship and not at all forced. I don't have much to say about this book sadly but I really liked it. The book was by no means original but it manage to make an awfully cheesy plot mesmerizing and unable to put down. I will definitely be reading the companion novel 'Lying out loud' and once I've read that I will read every other book Kody Keplinger has ever written. I am giving this book 4.5 stars out of 5 just because some parts were a bit to cliche for my liking. This book was a great read after the trauma of 'Half Wild'. It's ideal for a pick me up book. I would also like to say that when I see the film I will be doing a review of How good it was conspired to the book.